According to a recent survey of the Aeon e-commerce site for customers shopping at the mall, most customers are eager to shop online to save time. Recognizing the need and wanting to facilitate shopping of customers, Aeon has developed an ecommerce project where customers can choose the right quality products meeting their needs at www.AeonEshop.com . AeonEshop was established to solve the problem of using high quality Japanese products through safe online shopping. With that, consumers who are busy women in general and office workers in particular do not have much time to go to the mall can buy Japanese products online in a safe and easy way. 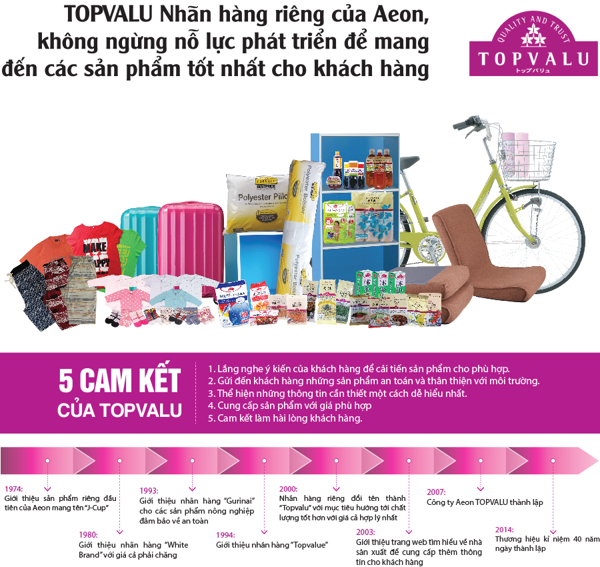 Most of Aeon products at supermarkets are available at AeonEshop including: fashion, cosmetics, furniture, electronics, home appliances, bicycles, stationery, food, mother & baby…and especially around 1000 TOPVALU products- Aeon house brand is being imported and updated continuously. Among categories in Aeon, Mother & Baby category is highly appreciated due to strict quality criteria and many famous brands in this industry. Some famous brands with high consumption level such as Meji, Goon, Moon Baby, Bambi…are all from Japan. In the near future, AeonEshop will continue to expand into the remaining provinces in the South and North as well as achieve a target of nationwide delivery. AEON is one of the largest retail trade corporations from Japan in the world with 179 joint ventures in and outside Japan. Established in 1758, with a history spanning more than 250 years, AEON Group is principally engaged in retail, finance, project development, ... in Japan in particular and throughout Asia in general. Throughout its operations, the AEON Group maintains an unchanged commitment to the "Customer First" criterion. The basic principle of the AEON Group is towards a prosperous, stable and peaceful society through retail activities. With that responsibility, AEON Group has gained the trust of customers as well as expanded its business not only in Japan but also in other countries in Asia for a long time. In Vietnam, AEON Vietnam Co., Ltd. was established in October 2011 to implement AEON's strategy "Transition to Asia". Specifically, AEON opened AEON Shopping Center - Tan Phu Celadon (HCMC) in January 2014, AEON Shopping Center - Binh Duong Canary (Binh Duong) in November 2014, Shopping Center AEON Long Bien (Hanoi) in November 2015 and AEON Binh Tan Shopping Center opened in July 2016, along with other centers throughout Vietnam in the future. TOPVALU – Aeon house brand has been a trusted brand in Japan and many other countries. Topvalu offers more than 6,000 different products and currently there are some TOPVALU products on sale in Vietnam.